Planting Dates: For spring, 4-6 weeks before the last average frost. For fall, 6-8 weeks before the first average frost. In general, February 10 - April 30 and August 10 - September 30. Planting Method: Seeds or transplants. Plant seed ¼ - ½ inch deep. Set transplant deep to the first true leaves. Final Spacing: 10-14 inches. Rows should be about 36 inches on center. Growth Habits: Cool weather leafy vegetables. Culture: Collard greens need cool weather, loose, well-drained, healthy soil. Normal water and fertility requirements. Collard greens that mature in cool weather will have the best flavor. If color is desired from the kale, don’t over fertilize. Troubles & Solutions: Cutworms, aphids, harlequin bugs, downy mildew, flea hoppers, loopers, and boron deficiency. Release beneficial insects and spray heavy insect infestations with citrus oil-based products. Replace trace minerals with Texas greensand. Harvest and Storage: Harvest young leaves as needed for cooking. Flavor is better after a frost. Can be stored up to 3 weeks at 32-40°. 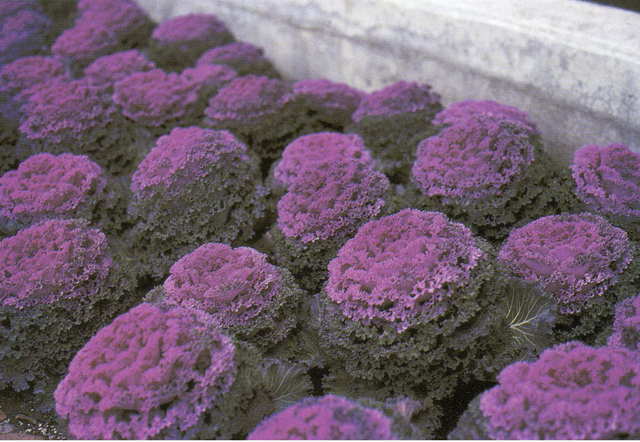 Notes: Kale is one of the best winter color plants. Both, especially the collards, do well from seed because they develop a deeper root system. Kale and other greens can be used as cover crops. Varieties: Collards - Blue Max, Georgia Champion Kale - Blue Knight, Dwarf Blue, Dwarf Scotch, Dwarf Siberian, Giant Southern Plant from transplants: Vates, Dwarf Blue Curled, Dwarf Scotch.